It’s been a long week of work, and you can’t wait to go to your favorite bar with all of your friends. Unfortunately for you, the bar is slammed and the bartender is totally overwhelmed with orders. You can’t seem to flag them down and eventually decide to take your business elsewhere or just go home. 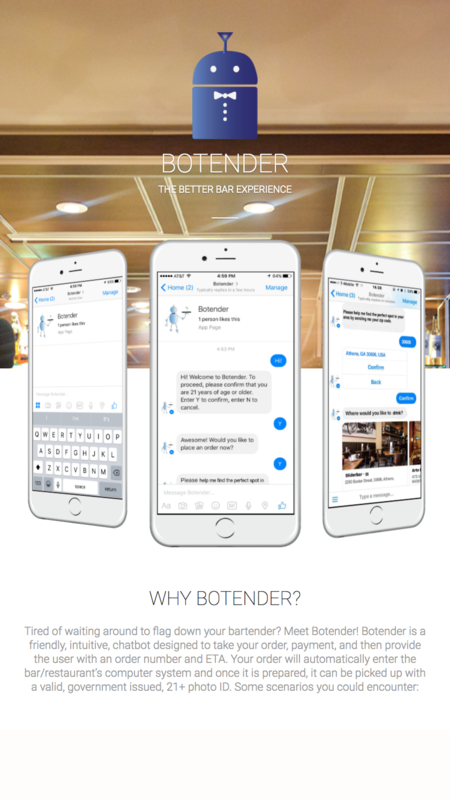 However, with botender, you can get your drinks without waiting for the bartender! It’s your best friend’s 21st birthday and they think you completely forgot to get them something. 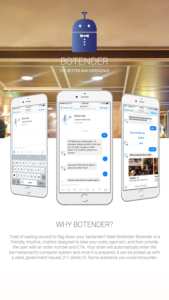 Little do they know, that with Botender, you can place an order of drinks for your whole crew and have them waiting on you when you get there! Botender saves the day! The weekend is finally here, and after spending all week studying for exams, you are in the mood to get out of your apartment. Unfortunately, you’re a bit of shy, and it’s really hard for you to get the attention of the new neighborhood bartender, who is a bit intimidating. Luckily for you, with Botender, you can order via a friendly chat bot instead! After placing and order and paying, just pick up your order from the bar with a valid 21+ photo ID and you are good to go!